Two SpaceX Falcon Heavy boosters make a simultaneous landing after launching the first Falcon Heavy rocket into orbit on Feb. 6, 2018. Elon Musk says SpaceX will soon try to land the upper stage of its workhorse Falcon 9 rocket using a "giant party balloon." From anyone else, it would sound ridiculous: Elon Musk says SpaceX is going to try to land a rocket stage with … wait for it … a "giant party balloon." Even Musk, SpaceX's CEO and chief designer, admits it's a pretty wild idea. Musk is presumably talking about the upper stage of the two-stage Falcon 9 rocket that serves as the workhorse booster for SpaceX launches. The upper stage is currently the only major component of the rocket that the Hawthorne, California-based aerospace company has not tried to reuse in its pursuit of a fully reusable launch vehicle. To date, SpaceX has successfully landed Falcon 9 first stages 23 times and re-flown 11 of them. Falcon 9 first stages perform engine maneuvers in space that send them back to Earth, where they can land on an offshore drone ship or landing pads near their launch sites. 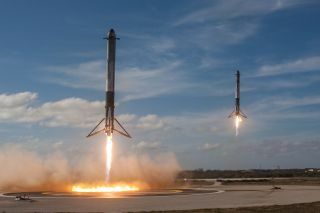 They use grid-like fins for stability during re-entry, perform engine burns to slow down and carry landing legs that fold out just before touchdown. The company has also reused two of its uncrewed Dragon cargo ships to deliver NASA cargo to the International Space Station (one of them is in orbit right now) and is actively trying to capture the payload fairings — or nose cones — that shroud and protect satellites and other payloads during launch. In fact, SpaceX will try to recover the payload fairings again today (April 16) when it launches a Falcon 9 carrying NASA's next exoplanet-hunting space telescope, the Transiting Exoplanet Survey Satellite. You can watch that launch live on Space.com at 6:30 p.m. EDT (2230 GMT) today. Musk did not reveal a timetable for the "giant party balloon" landing test or details on how it works, but he did say that a sturdy balloon has a good shape to withstand the stresses a rocket stage endures during its supersonic descent back to Earth. A giant balloon is "great for creating a giant object that retains its shape across all Mach regimes & drops ballistic coefficient by 2 orders of magnitude," Musk wrote. Musk also said that SpaceX already brings its Falcon 9 upper stages back to Earth. They are intentionally disposed of in the Pacific Ocean so they don't become space junk. "We already do targeted retro burn to a specific point in Pacific [with] no islands or ships, so [the] upper stage doesn't become a dead satellite," Musk wrote on Twitter. "Need to retarget closer to shore & position catcher ship like Mr. Steven." Mr. Steven is a ship equipped with a net and giant metal arms to catch falling Falcon 9 payload fairings. Musk has called it a "catcher's mitt" in boat form. SpaceX's use of a giant balloon for a rocket won't be the first time a company or space agency has attempted to use an inflatable system for re-entry. NASA has conducted several experiments using inflatable "flying saucer"-shaped inflatable heat shields for Mars landings. And in 2012, the private spaceflight company Armadillo Aerospace launched an inflatable balloon parachute, or "ballute," as a part of a re-entry technology test.